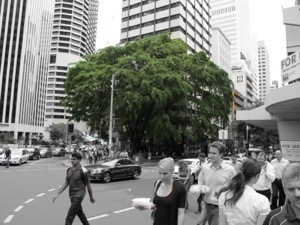 We have intrinsically known that trees add benefit to a city or a development for a long time, they shade, they cool, they take pollutants out of the air, they filter water but how do you put a value on that? A group in the US has come up with a way of quantifying the benefits, and they have an Australian version. It has taken David Nowak some 20 years to come up with an accurate way of calculating the benefits of trees – not surprisingly it’s a very complicated process. But now that he has done it a allows us to quantify the ‘asset value’ of trees. For example “New York, has 876,000 trees, covering 23.1% of the city. They provide $11.2 million in annual energy savings, have a carbon sequestration value of $386,000, and a pollution removal value of $836,000.” From a tree! Putting a price on carbon is what is referred to as costing externalties. In economic terms an externality is the cost of something that is not passed on through its price. So before our carbon tax in Australia the ‘cost’ of the impact of carbon emissions was not passed on through the price of electricity. Landfill tax is similarly costing an externality. Costing the externality of our consumption is an important part of solving the myriad of problems we face in the future. Seeing and paying for the true cost of products will provide us a far greater understanding of our impact on the planet, and enable us to make more informed decisions. The work that David Nowak has done enables us to calculating the externality savings of a tree, the $12million savings from the New York trees is externality savings. But factor in the externality savings of the tree and the lifecycle ‘cost’ changes dramatically – yes it costs to maintain the tree but you also generate revenue from the externality savings. Its great that we can calculate these impacts and big data allows us to monitor the claimed benefits and audit the actual benefits. But, this is only useful if the cost or savings of externalities has a price or that someone is willing to pay for them. The biggest change we can make is to move to the new economy that calculates and costs all externalities not just carbon.